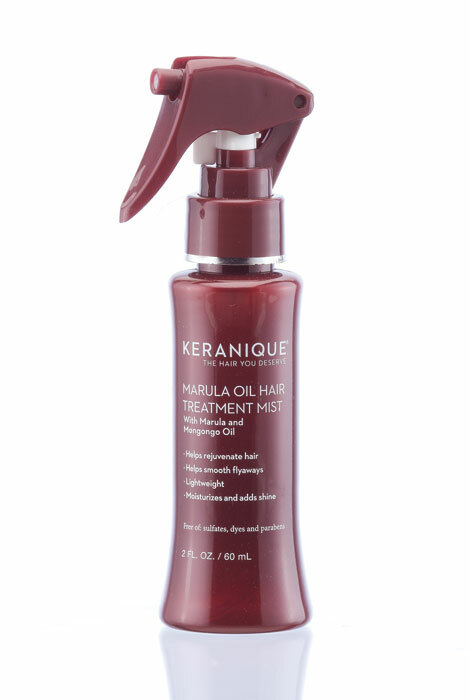 Add instant moisture and shine to thin hair with this easy-to-use Keranique® Marula Oil Hair Treatment Mist. Fine, thinning hair will look and feel softer and healthier with this multi-benefit lightweight thinning hair oil that revitalizes, increases shine and fights fly-aways. The blend contains natural protective African oils including mongongo, marula and cyperus oils to create a light layer of moisturizers without build-up. To use, apply to clean damp hair before blow drying, or apply after blow drying to help control frizz and add extra shine. My long hair has gotten curly, fuzzier, drier W aging....58. Smell is nice, not too strong. Works well making hair smoother. Helps calm down humidity fizz....live in Houston. Will continue to use it forever. Is good product for my hair. All us them. Have not seen this Keranique product anywhere. My colored hair is very dry. I'm sixty years old and I'm going bald.